Recombinant full length protein corresponding to Human EDA2R/XEDAR. Our Abpromise guarantee covers the use of ab37171 in the following tested applications. WB Use a concentration of 0.5 - 1 µg/ml. Detects a band of approximately 33 kDa (predicted molecular weight: 33 kDa). ab37171 at 10 µg/ml staining EDA2R/XEDAR in human skin tissue section by Immunohistochemistry (Formalin/ PFA fixed paraffin-embedded tissue sections). ab37171 has not yet been referenced specifically in any publications. Publishing research using ab37171? Please let us know so that we can cite the reference in this datasheet. Thank ypou for your mail. Here is the reply from customer. Sorry for the delayed reply,since I was on leave I could not mail you.I am attaching couple of my failed western blots results with XEDAR antibody which I have performed with different variations like primary antibody concentrations from 0.1 to 1ug/ml ,secondary antibody was used from two different companies,but still I did not get any bands. I even have other failed blots which I will mail you once i find them,as they were of no use I had not preserved them. Please go through the attached blots. Thank you for taking the time to complete our questionnaire and send these images. I am sorry to hear you have had difficulty obtaining satisfactory results from this antibody. I appreciate the time you have spent in the laboratory and understand your concerns. It is regrettable the results have not been successful. I would like to reassure you that this antibody is tested and covered by our six month guarantee for WB and human samples. Regrettably in this case the product was purchased in 2011 (longer than six month ago) and is for this reason it is not covered by this guarantee. I would like to offer some suggestions to help optimise the results. I would also appreciate if you can confirm some details of the procedure. 1. Could you confirm which secondary antibody exactly was used for this experiment? I have never heard of a secondary antibody raised in human. It would be helpful if you could forward the catalogue number and company name where it was purchased. I would be pleased to compare the secondary for suitability. 2. We would recommend it might be beneficial to integrate a loading control within the experiment if not already performed. A loading control will ensure that the sample is of good quality. Furthermore it will assess the transfer of the sample to the membrane. 3. Additionally we would suggest performing a no primary control if not already done. This will show if background that is detected might be due to non-specific binding of the secondary antibody. 4. Sometimes the change of blocking solution can improve the result of a WB. We would suggest it might be beneficial trying to block with 3-5% BSA instead of milk. 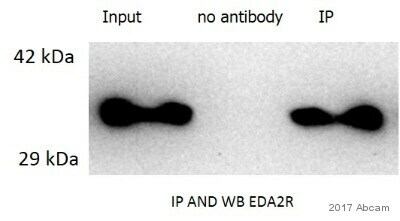 An example for how the blocking can affect the result is shown for our GAPDH antibody ab9385 here: www.abcam.com/ab9385 . We are happy to offer this technical support. I hope this information may be helpful, thank you for your cooperation. Should the suggestions not improve the results, please do not hesitate to contact me again with the further requested details. Here is a complain from one of the customer . This antibody has been replaced earlier and that is replaced antibody supplied before a year ago . No it varies,from totally dark back ground to ,many non specific bands(without any specific band) or a totally clear blot. Tried with different protein concentration,different dilution of primary and secondary antibody,different cell lines.secondary antibodies from two different companies. I would like to reassure you that ab37171 is tested and covered by our 6 month guarantee for use in WB and human samples. In the event that a product is not functioning in the applications cited on the product data sheet, we will be pleased to provide a credit note or free of charge replacement. We are also pleased to provide technical support to help to improve the result. Reviewing this case, I would appreciate if you can send some of your different WB results. Could you confirm, what the differences were performing this WB experiments? Thank you for your cooperation. I look forward hearing from you with the further requested details. I would like to know whether the Eda2r antibody (ab37171) has also been tested for IHC (or western) on mouse tissues? Thank you very much for your interest in ab37171. To our knowledge, ab37171 has not been tested in mouse. Therefore, I can offer a discount off a future purchase if you buy ab37171 now, test it in mouse and submit feedback to us in the form of an Abreview. It doesn’t matter whether the Abreview is positive or negative, we would just really like to receive your feedback. The discount would be to the value of 1 free primary antibody. If you are interested in this offer, please follow these steps: 1. Reply to this e-mail to let me know that you would like to proceed and test ab37171 in mouse. I will then send a discount code. This code must be issued before purchasing ab37171 so please wait for my reply before ordering. 2. Purchase ab37171 either by phone, fax, or online (www.abcam.com). 3. Test it in mouse. 4. Let us know the results, positive or negative, using our Abreview system (this will take about 10 minutes and images are great if you have them!). To find out more about our Abreview system, please visit: https://www.abcam.com/abreviews. 5. After the review is submitted to us, the discount code becomes active. Simply place your new order by phone, fax, or on the web and mention the discount code. The discount can be redeemed for any primary antibody ordered and the discount code is valid for 4 months after issue. We are always pleased to obtain feedback about our products and any information is greatly appreciated! Even if ab37171 turns out to be unsuitable for mouse, you will still receive the discount on your next purchase after your Abreview has been submitted. Please let me know if you have any questions about this offer and I would be happy to help you further. The Terms and Conditions of this offer can be found at: www.abcam.com/collaborationdiscount.